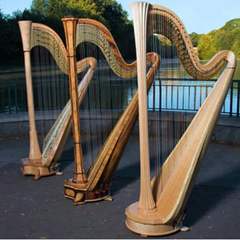 What could be more beautiful than the ethereal sound of the harp, but a group of harps playing together! Under the direction of UNC faculty harpist, Laura Byrne, this group of talented artists will perform musical favorites from around the world from the Baroque, Classical, Romantic, and Impressionist eras all the way to the music of today. Join us on a musical journey through the centuries - five harps in the beautiful River Dunes Harbor Club. River Dunes 465 E. Harborside Rd.